Are you a lawn owner in Round Rock, TX? Looking for lawn mowing services? The GoMow team is equipped to assist with all Lawn maintenance needs in order to provide the best residential lawn care services. Residential Lawn Mowing in Round Rock, "You Click,We Cut"
Are you planning to enjoy a vacation this year outside of Round Rock, TX? Are you worried about your lawn care? No worries, GoMow is here. We are mowing on your street! GoMow is honored to offer lawn care and lawn mowing services to Round Rock residents. Click here gomow.com to get FREE QUOTE for lawn service estimate, select from one of the many different lawn maintenance service plans available to the residents of Round Rock and have GoMow maintain your lawn today! 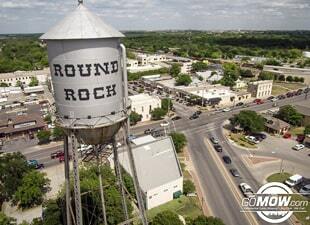 Round Rock, the pride of the Texan state, voted as the seventh best smallest American city to live in back in 2008 and the second fastest growing city in the US, in 2009. Round Rock is more commonly known as the chief headquarters of Dell computers which provides employment for over 16,000 people in the area. Lawn Mowing Service in Texas areas Starting at only $23. Today Sign Up for lawn mowing service! Whether you want to maintain your turf areas, add to existing flower beds or simply grow a completely new vegetative cover from scratch, the GoMow team is equipped to assist with all of your Lawn care needs in order to provide the best lawn service Round Rock TX. Contact GoMow Lawn Care Services to help you get set up on an ongoing lawn maintenance and lawn treatment services in Round Rock today.